Kim Stanley Robinson. Photo by Catriona Sparks. Kim Stanley Robinson has won the 2016 Robert A. Heinlein Award. Sponsored by the Baltimore Science Fiction Society, the award is given to an author of outstanding published works in science fiction and technical writings that inspire the human exploration of space. Robinson has been selected as this year’s winner in recognition of his body of work, including 19 novels (such as his Mars trilogy), and over 40 short stories. The award will be presented during Balticon 50 opening ceremonies on May 27. 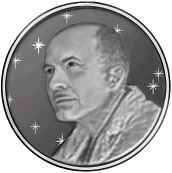 The Robert A. Heinlein Award is a sterling silver medallion bearing Heinlein’s image as depicted by artist Arlin Robbins. A grant from the Heinlein Society funds a third of the costs associated with the award. The winner also receives two lapel pins for use when a large medallion is impractical, and a plaque describing the award. The award selection committee is chaired by Michael F. Flynn and is composed of science fiction writers. The list of past winners of the Robert A. Heinlein Award can be found here. The full press release follows the jump. 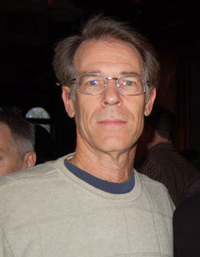 Kim Stanley Robinson, science fiction author, is the 2016 winner of the Robert A. Heinlein Award. The award is bestowed for outstanding published works in science fiction and technical writings that inspire the human exploration of space. This award is in recognition of Mr. Robinson’s body of work including 19 novels, including his groundbreaking Mars novels, and over 40 short stories. The award will be presented on Friday, May 27, 2016 at opening ceremonies during Balticon 50, the 50th Maryland Regional Science Fiction Convention. Balticon and the Robert A. Heinlein Award are both managed and sponsored by The Baltimore Science Fiction Society. A grant from the Heinlein Society funds a third of the costs associated with the award. More information on the Robert A. Heinlein Award, including past winners, can be found at http://www.bsfs.org/bsfsheinlein.htm. Mr. Robinson lives in the state of California, USA. More information on Balticon can be found at www.balticon.org. To contact the Heinlein Award liaison at BSFS, email dale@bsfs.org. For immediate release, this announcement is not embargoed. This entry was posted in Awards and tagged Balticon, BSFS, Kim Stanley Robinson, Robert A. Heinlein Award by Mike Glyer. Bookmark the permalink. Congrats to Mr. Robinson! The imagination he lends his books is impressive. Oh dear, the BSFS has spelled his name incorrectly on their award page. Congratulations to Robinson on a well-deserved honor. He is certainly joining an august company. JJ: After seeing your comment I sent them an email about the typo. Well-spotted, JJ — you might have saved them an embarrassing engraving typo. Can’t think of anyone who deserves this more, given the stated purpose. Stan’s always got us humans out there in space. Have you read KSR’s new novel Aurora? He completely rejects space travel and grotesquely and creates a nasty, buffoon-like parody of Arthur C. Clarke. I don’t know what’s gotten into the guy – SF authors often turn mean and crazy when they get old – but I’ll never touch his stuff again. To give him this award dishonors everything good about Heinlein. If you don’t believe me, just read Aurora. I was shocked myself. This is hilarious. Stan Robinson is totally opposed to human attempts at intersteller colonization, thinks the idea is impossible, and people ought to learn better. That’s the point of his latest, AURORA, but his views are the opposite of a secret.